Instant tasty and healthy pizza made with bread. You can prepare it for birthday parties, tea time snacks. Easy and yummy. If you and your kids don’t like eating any vegetable, this is something you should try atleast. 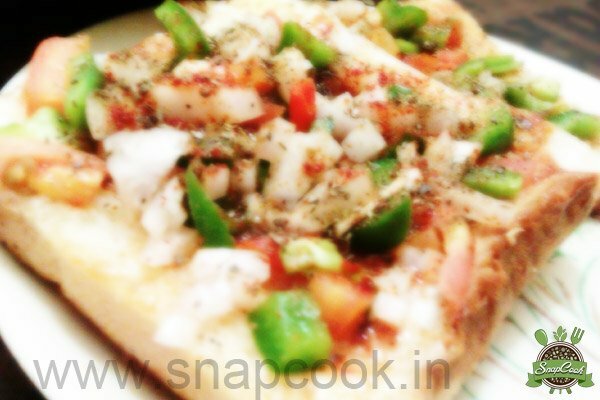 Take bread slice apply 1 teaspoon of malai followed by pizza sauce over it. Now sprinkle chaat masala, Red chilly powder, oregano on the top. Apply little ghee/butter on tawa and place prepared bread slice on it. Cover it with lid and cook on low flame for 3-4 minutes. Make this as close to serving time as possible else the crispiness of bread will go off. You can grate cheese on the top of bread before placing it on tawa. You can use paneer, corns, mushroom, cauliflower or veggies of your choice.